The state of West Virginia has played home to one of the most bizarre "pseudo-cryptids" ever reported, the unusual - but by no means, unique - Mothman. The first sighting came in the early 1960s. A woman was driving along Route 2, near the Ohio River, with her father. As she neared the Chief Cornstalk Hunting Grounds, a large man-shaped figure walked out onto the road. As the woman slowed her car, the figure spread two large wings and took off. Ironically, the witness did not report the incident - "Who would believe us, anyway?" In the summer of 1966, a doctor's wife in the same general area said that she had seen a six-foot long thing resembling a "giant butterfly". On November 12, five gravediggers (how appropriate a profession!) saw something which looked like a "brown human being" fly out of the trees near Clendenin. One of the witnesses, Kenneth Duncan, said that they watched the creature for almost a minute. On the 14th of the month, Salem resident Newell Partridge saw two red objects hovering above a field. His German Shepherd, Bandit, took off into the field and was never seen by Partridge again. The next night, Mr. and Mrs. Roger Scarberry and Mr. and Mrs. Steve Mallette were driving near the "TNT Area", near the town of Point Pleasant. A tall figure stood by the side of the road. "It was shaped like a man, but bigger," said Mr. Scarberry. "Maybe six and a half or seven feet tall. And it had big wings folded against its back." His wife commented on its huge red eyes, "like automobile reflectors." Mr. Scarberry, who was driving, took off in his car at "better than a hundred miles per hour," the figure spread its wings and flew after the car. It didn't seem to flap its wings at all, and its wingspan was over ten feet. Mrs. Mallette said that it made a squeaking sound, "like a big mouse." The four also noted that a dead dog had been lying by the side of the road, but was gone when they returned. The witnesses ran to the Thomas home, where they were let in by the three children. The figure shuffled along behind them, coming onto the porch and looking through the window. Mr. Wamsley called the police, but the thing had, of course, vanished by the time they arrived. Mrs. Bennett, who lives at the edge of Point Pleasant, says she has heard the creature on other occasions. She describes the sound it makes as "like a woman screaming." Tom Ury was driving along Route 62, near the TNT Area, on the morning of November 25. He saw a large, grayish figure standing in a field. Then it spread two large wings, lifted straight into the air, and flew over Ury's car at an altitude "three telephone poles high"--probably about 50 or 60 feet. The next day, Mrs. Ruth Foster of St. Albans said the creature was standing in her yard near her porch. Her description tallys with West's. The same day, people in Lowell, Ohio, saw several large birds flying over Cat's Creek. The three witnesses followed the birds in their car and said that they were "...dark brown with some light flecks. Their breasts were gray and they had five- or six-inch bills, straight, not curved like those of hawks or vultures." The birds seemed to have reddish heads. And still more sightings came. On November 27, on the way home from church, Connie Carpenter saw a grayish figure standing on the golf course near Mason. The creature took off and flew straight towards her car. She was one of few who actually saw the creature's face, although her description--"It was horrible"--doesn't help much. Another sighting took place that same night in St. Albans, where two girls saw the creature near a junkyard. The creature flew after them. 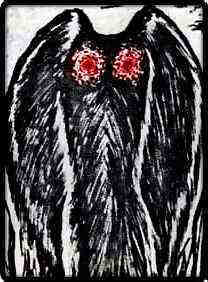 Mabel McDaniel (coincidentally, mother of Linda Scarberry, one of the first witnesses) saw Mothman on January 11, 1967. Mrs. McDaniel said that at first the creature looked like "an airplane, then I realized it was flying much too low. It was brown and had a wingspread of at least ten feet." In March, an Ohio man claimed his car was chased by a flying creature. In late 1966, when the Mothman reports started to die down, other phenomena started up in the area. Several UFOs were seen near Point Pleasant, animals were mutilated in surrounding areas, and Mothman witnesses reported poltergeist and "men in black" phenomena. This has led many a researcher to speculate on a connection between Mothman and UFOs. But no discussion of the Mothman phenomenon would be complete without recounting the story of the Silver Bridge. On the evening of December 15, 1967, the Silver Bridge, which crossed the Ohio River at Point Pleasant, collapsed in rush-hour traffic. Over forty-six cars fell into the river. It was the biggest disaster ever to hit Point Pleasant. Not surprisingly, most scientists scoffed at this theory. They said it was probably just some normal kind of bird; the favored culprit was a sandhill crane. These large birds have reddish patches on their heads (accounting for Mothman's "red eyes") and a large specimen would reach roughly the size attributed to Mothman. But other birds were found in the area that could account for the sightings. In July of 1967, several boys found a large vulture near New Haven. And at Gallipolis Ferry, a farmer shot a rare bird indeed--an Arctic snow owl. The owl was two feet tall and had a five-foot wingspan. SOURCE-Keel, John A. The Complete Guide To Mysterious Beings (New York: Doubleday, 1994). pp 245-274.